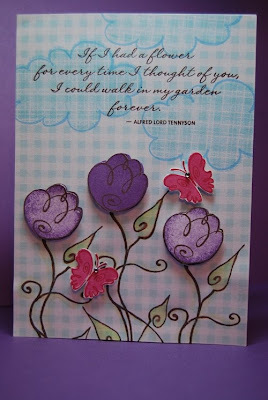 This sweet card uses the April SOTM "Blessed" just like my last posting with the rainbow butterflies only this time I've used the beautiful sentiment and the tulip flowers that come with the stamp set too! I've used some old Heavenly Blue gingham print paper for the background and stamped the clouds, sentiment and flowers directly onto the paper. I then stamped the butterflies and the flower heads onto separate cardstock, cut them out and pop-dotted them onto the piece for dimension. The leaves were colored in using our Waterbrush and Topiary inkpad directly onto the patterned paper as well. The cocoa ink outlines ran a wee bit because of the waterbrush moisture so I went back in after they dried with a watercolor pencil to fill in any lines that had become fuzzy.